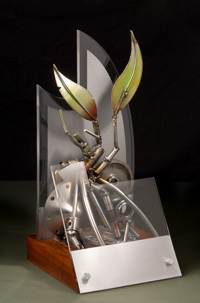 Winners of the 2008 EPA Sustainable Industries Awards will take home trophies designed by Australian sculptor Mick Zalesky. The CRC for Construction Innovation project, LCADesign, has been announced as one of three finalists in the Environmental Protection Agency 2008 Sustainable Industries Awards, in the category of Innovation in Sustainable Technologies. The Innovation in Sustainable Technologies Award is presented to an organisation for technologies or process improvements that achieve increased sustainability by saving energy or water, reducing waste, or delivering another form of environmental benefit. LCADesign was developed by the CRC for Construction Innovation and led by Queensland Department of Public Works and CSIRO. The Eco-Profiling software enables building design professionals to quickly forecast a building’s potential environmental impact over its lifetime. The program uses a three-dimensional Building Information Model to analyse up to 140 indicators including energy and water, greenhouse gas emissions, resource depletion and damages to human or ecosystem health. Analysis during the early planning stages allows choices to be made that will result in a more environmentally sustainable building. The nomination by EPA recognises LCADesign as one of Queensland’s best and most innovative sustainability initiatives. Winners of the EPA 2008 Sustainable Industries Awards will be formally announced at a black tie gala event on Friday 31 October on the Gold Coast. Further information including ticket bookings and details of all finalists can be found on the Environmental Protection Agency website at www.epa.qld.gov.au.